I really want to enjoy singing from it, but to be honest, I miss the extra umph the fundies put into the singing. When I’m driving alone in my car, I’m probably singing Crosby, not Bonar. What do you like about it? The history of it? The wonderful expressions of our faith? I like those too. It makes a great poetry book. I just don’t enjoy singing it. You’re certainly right about the reasons I love it. The history of it and the theological depth when compared with the revivalist gospel songs and their “extra umph” as you describe it. Getting to see what I’d been missing in terms of worship music as I was developing my Reformed views makes it an indispensible part of my identity as a Reformed Christian. I associate what you miss about IFB worship music with the relative shallowness of their texts and don’t miss it at all–and that which was worth retaining is retained in the Trintiy Hymnal (with occasional Calvinist rewrites, or returning to the original Calvinist version) as you know. Sorry you have such trouble with it. First impressions often make a big difference. You had a bad one, I had a good one. Crosby’s not so bad all the time…you should hear the Christian pop drivel I listen to in my car. The CCM I grew up with. I’ll endure bad theology (from my own generation) if the sound is right, but that’s just me. Don’t try this at home! I don’t know if the revival era songs had more umph in them, or if the type of church that sings them has more joy, or whether the songs themselves are very slow and sad, or if the type of church that uses the Trinity hymnal is joyless… I may be multiple or none of these. I only know that I’ve never been in a service with the Trinity hymnal where the singers didn’t seem flat and joyless. I do greatly appreciate the poetry of the Trinity works. I’ve been reading some of Watts stuff lately and I think he’s the best. By the way, wouldn’t a Trinity hymnal guy be sort of reformed-lite. I mean, come on, don’t ‘real’ reformed folk sing Psalms? Watts is definitely the best. Be sure to check out his “official online biography” in the link on his name in my current devotional I posted this morning. I didn’t assume you were pining for contemporary music, but I see the a parallel with CCM in the revival era’s pairing more popular music styles with their more man-centered, experience-oriented “here’s what Jesus did for me, he can do it for you, too!” testimonial lyrics. That’s why I favor the pre-revivalism historic theocentric hymnody. But I understand and respect what you’re saying about your preferences. I’m by no means a “Truly Reformed” type. I don’t have the luxury of holding out for the most idealistic stand on every point. I find the historic Reformed arguments for exclusive psalmody interesting and compelling, but I also see the logic in explicitly singing Christ’s praises in Scripturally consistent though uninspired hymns. After all, how could some of those ancient hymns that Paul wrote into some of his epistles have been approved for use by the Holy Spirit if Christians were supposed to only sing psalms? …the way it sounds, that is. I already enjoy the lyrics. I like your argumentation regarding EP. I downloaded a work by Watts on this same issue a while back and I like his approach. Perhaps the reading of a Psalm during worship and singing the corresponding Watts hymn would be a good way for us to understand how the Old Testament pointed to Christ. Mind sharing that link to Watts on psalmody? I’d like to see that. I haven’t been Reformed long enough to have any real expertise on just what would be the best way to feature the Psalms and emphasize how they point to Christ in a service. Thus I’m eminently qualified to blog about it. 😉 But what I can do is see how what in my experience is the average approach by the average Reformed church which uses the Trinity Hymnal. 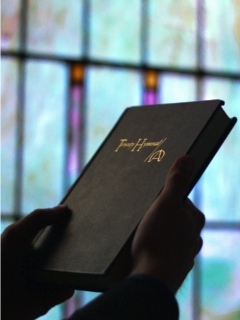 This chapter in Hart’s book on the hymnal points out that the 1961 edition includes 146 Psalms from the famous 1912 Psalter of the Christian Reformed Church, which is more Psalms than are featured in any other modern hymnal. So the versified Psalms being included among the hymns in the typical Lord’s Day singing has apparently been acceptable to most Reformed churches. At the very least, that satisfies the face value meaning of “psalms, hymns and spiritual songs,” in my humble, amateur opinion.